Exit the M6 at Junction 19 (sign-posted ‘Manchester Airport, Stockport A55, M56 East’) and at the roundabout turn right onto the A556. At the Bowden roundabout after 4.2 miles, turn right (sign-posted ‘Manchester M56’) onto the M56 motorway. Exit the M56 motorway after 6.9 miles (sign-posted ‘Stockport M60, Sheffield M67’) onto the M60. Exit the M60 at Junction 1 (sign-posted ‘Stockport Town Centre’). At the roundabout, follow signs to ‘Cheadle A560’ also ‘Stockport County FC’ into Hollywood Way. Go straight on at the first set of traffic lights and turn right at the next (sign-posted ‘Cheadle A560, Stockport County FC’) onto the A560 towards ‘Ye Olde Woolpack’ pub. After 1.1 miles, turn left (no signpost, by the ‘Farmers Arms’) onto the B5465 Edgeley Road. After approximately 1 mile turn right into Dale Street at the traffic lights and take the second left into Hardcastle Road for the stadium. Follow the M62 onto the M60 and continue south. Exit the M60 at Junction 1 (sign-posted ‘Stockport Town Centre’). At the roundabout turn left following signs to Cheadle A560 into Hollywood Way. At the roundabout, follow signs to ‘Cheadle A560’ also ‘Stockport County FC’ into Hollywood Way. Go straight on at the first set of traffic lights and turn right at the next (sign-posted ‘Cheadle A560, Stockport County FC’) onto the A560 towards ‘Ye Olde Woolpack’ pub. After 1.1 miles, turn left (no signpost, by the ‘Farmers Arms’) onto the B5465 Edgeley Road. After approximately 1 mile turn right into Dale Street at the traffic lights and take the second left into Hardcastle Road for the stadium. Follow the A6 towards Stockport/Manchester. Continue along A6 until reaching major traffic lights at hazel Grove alongside the ‘Rising Sun’ pub. Follow signs for Stockport Town Centre along the A6 for approximately 2.8 miles, until reaching the traffic lights by ‘The Nelson Tavern’ and the Town Hall. Turn left (sign-posted ‘Cheadle, Stockport County FC’) into Greek Street. At the roundabout after 0.3 miles take the second exit (sign-posted ‘Cheadle A5465’) onto Mercian Way. Take the second left turning into Caroline Street for the stadium. Stockport Railway Station is situated approximately half a mile from Edgeley Park. Walk down steps from platform and turn left (opposite direction to booking office). Walk up Station Road, cross the main road at ‘The Blue Bell’ and continue up the hill towards the roundabout. Take the A5464 (Mercian Way) and turn left into Caroline Street for the stadium. There is limited parking in the surrounding roads. 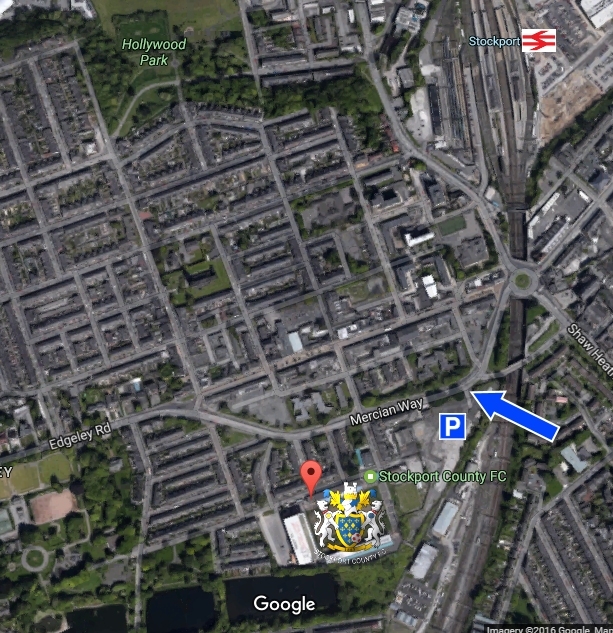 Please be mindful of matchday parking restrictions and the needs of our neighbours when parking.